The Devils Marbleyard hike on September 16 was not for the faint of heart. 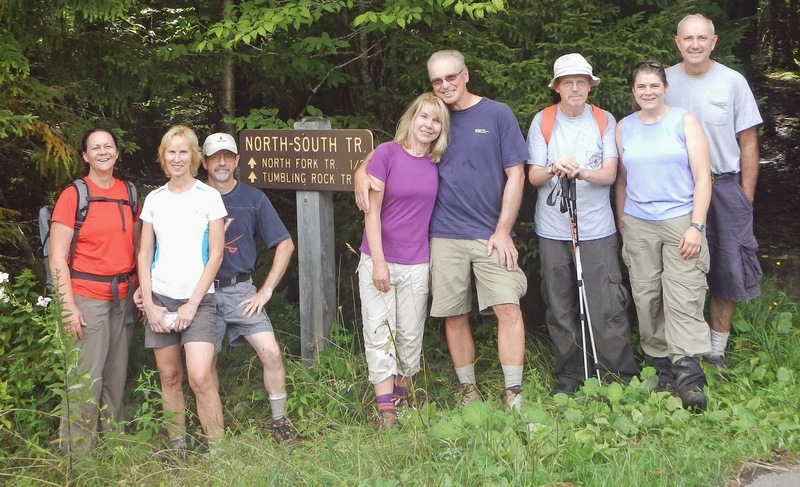 Hike leaders, Pete Fink and Marit Gay, put together an adventure hike described on the PATC schedule to include bouldering, bushwhacking, and hiking. Five fearless hikers took the challenge including Clai Lange, Bev Fink, Dave Borszich, Barbara Martin, and Michael Seth. The hike began in the James River Face Wilderness within the Jefferson National Forest. The usual 8.3 mile loop starts with the Belfast Trail, skirts the boulder field, connects to the Gunter Ridge Trail, and loops back southeast across Little Hellgate Creek on the Glenwood Horse Trail. Pete had wanted to find a way to climb up through the boulder field and bushwhack back down to find the Gunter Ridge Trail. He used coordinates from where the Belfast Trail intersects the Appalachian Trail to help track a line. It was not easy going, but provided for an adventure we will all remember! Dave took the day off of work to do this crazy hike! It took us over two hours to climb the boulder field and bushwhack to connect to the Gunter Ridge trail, which was less than a mile in length. But we persevered and we were elated to finally find it. A short lunch and homemade cookies were enjoyed at the campsite near the AT intersection. Next time we would like to do the 3 mile spur, because there is a spectacular 360 degree view at a clearing known as the "Helicopter Pad" on the un-maintained Sulphur Spring Trail. We were a bit worried about having enough time to complete the Gunter Ridge Trail to do it today though. John Shannon, John Brandt, Marian Styles, Rich Bard, Bill Holman, C.J. Woodburn, Iva Gillet, and Emily Berry from Charlottesville joined Michael Seth who led this short hike/worktrip on a sunny hot late August day. At the trailhead they were joined by Lynn and Malcolm Cameron, Mike and Karen Waterman, from the Southern Shenandoah Valley Chapter. We parked our cars along Cub Run Road walked about a quarter mile to the start of the orange blazed Massanutten Trail. Then after .7 of a mile we turned on the 1.9 mile Second Mountain Trail to Kaylor Knob about a 1100 elevation gain. As we ascended Second Mountain we cut back on blueberry bushes and scrub oaks that were closing in on the trail with our loppers and clippers. With many hands we made considerable progress. We quit half way up, having tackled the worst sections and had lunch at the top. Although the hike leader promised good views to the east they were obscured by the newly grown chestnuts trees. Michael Seth shared peanut butter and chocolate chip cookies his wife baked and John Shannon shared delicious pumpkin cake. But at least it was a little cooler at the top. After our descent we stopped at a watering hole near where we parked our cars. Although the water level was low it was deep enough to soak in and all but Emily, Mike Waterman and Bill did so. Afterwards some of us stopped at Hank's Smokehouse for beer and food. 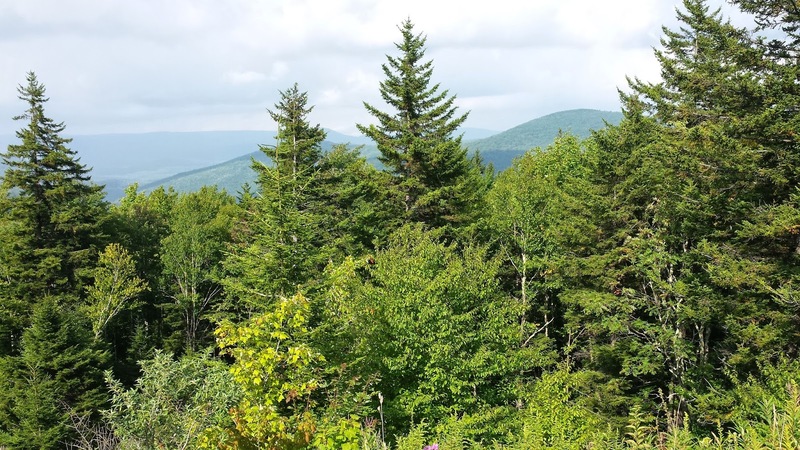 Hike leaders Kelly O’Rourke and Michael Seth planned a 2 day weekend to explore the southernmost terrain typical of New England wilderness - full of spruce, hemlock, bogs and ferns. CJ Woodburn organized an elaborate camp dinner of Tex-Mex dip; homemade parmesan chips; chicken, steak and veggie kabobs; and salad. Bill Holman cooked over the open flames in the fire pit that Geoff Manning-Smith had kept burning from his arrival on Thursday to his departure on Monday. We all enjoyed an amazing birthday cake from Chandler’s for CJ’s birthday, so there was no roughing it in the wilderness for us! Watoga State park allows for the choice of cabins or camping, so the couples - Kelly and Charles Staples and Susanna and John Williams - enjoyed cabin stays while Mike Smith, Geoff, CJ, Iva Gillet and Bill chose the remote campsite where we saw no one else. Mike Seth really roughed it by staying in a nearby hotel! The stars and Milky Way were impressive during the new moon and we had pleasant temperatures with just a passing shower on Saturday night. Saturday morning we met at the Greenbrier river trail and headed to the Cranberry Glades Wilderness area that is ~ 8 miles from the Watoga State Park. All but Geoff and Bill went 9.5 miles thru the wet bogs. We also enjoyed a trail next to the Williams River. Fortunately we had taken time at the fabulous Visitor’s Center to get maps of this region that are hard to find. 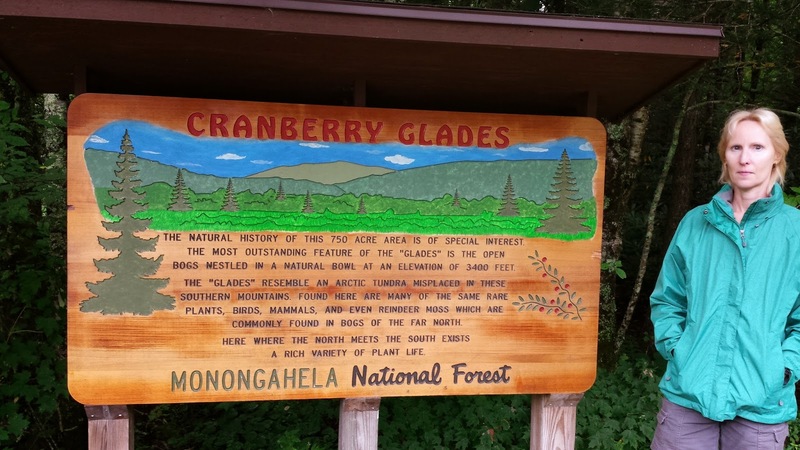 There was a wonderful relief map of the Monongahela National Forest and many wonderful displays. Sunday Iva, Bill, Geoff, the Michael’s, Charles and Kelly walked the half mile boardwalk trail in the glades we saw the carnivore pitcher plants and other things that Mike Smith and Mike Seth knew the names of. Then we started on the Cowpasture Trail loop. Kelly and Charles made the whole circuit while the others turned around to get back to civilization earlier in the day. The Cowpasture trail should have been named the hemlock/crabapple/cool bridge with beaver dam trail. Kelly/Charles finished the ~ 8.5 mile loop then headed up to High Rock; a 3 mile out/back. The views would have been spectacular in better weather, as it was cloudy and mostly obscured. 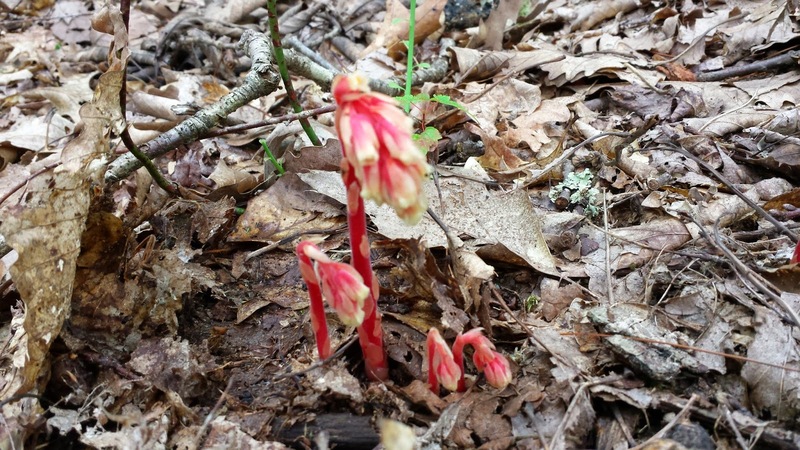 Monday Kelly/Charles did the very pretty Arboretum ~ 4.5 mile loop where we spotted some unusual red mushrooms that looked like Indian pipes (maybe pinedrops related to Indian pipes). We finished our tour of Watoga by going on a couple more trails in the park. We all had a wonderful weekend and look forward to doing it again, as there are many, many miles of trails in this remote, underutilized region.